Magnificent blue on pale blue shading. A truly mesmerizing degign inspired by the movie. 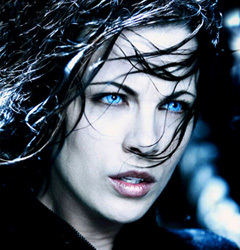 Another interesting blue contact lenses inspired by the Underworld vampire franchise. ColourVue Crazy Underworld Selene feature blue and light blue pattern which gives them depth and makes them stand out. Thanks to a darker blue outer edge they have more contrast. They will look great not only in vampire costumes but also with every day make up as they are quite pretty and can be used as a daily fashion accessory.